The Orienta Foundation is an institution monographic with over 40 years’ experience in comprehensive community mental healthcare for children, young people and their families. The foundation is a pioneer in the field in Catalonia and aspires to being an international benchmark. It runs various projects in prevention, health promotion and innovation. It offers outpatient public healthcare to children and young people from birth up to the age of 17 and a partial hospitalization service for young people between the ages of 12 and 18. It follows a healthcare model based on comprehensive, ethical and respectful care, scientific rigour and innovation. It is located in Baix Llobregat (Barcelona). Currently, it manages five mental healthcare centres for children and young people (CSMIJ) and two day hospitals for adolescents. Its practice area is Baix Llobregat, although it also takes consultations from other parts of Catalonia. The foundation collaborates in the areas of training and research with major international institutions such as the European “KidsTime Foundation”, the “Personality Disorders Institute” in New York and the “Anna Freud Centre” in London, as well as with national institutions such as the Vall d’Hebron Department of Psychiatry, the University of Barcelona, the Sant Joan de Déu Healthcare Park and Benito Menni CASM. In 2010, it was awarded ISO 9001 Quality certification. For 13 years it has published the journal “Psicopatologia y Salud Mental del niño y del adolescente” (Psychopathology and Mental Health in Children and Young People), a compilation of highly specialized articles written by internationally renowned professionals and distributed in over 16 countries. It has also created the informative website www.orientat.org, which offers help, guidance and prevention in mental health, aimed at parents, children and young people, and includes a specialized space for professionals in the fields of healthcare, education and social intervention. The Orienta Foundation has five mental healthcare centres for children and young people and two day hospitals for adolescents. The services are located in the region of Baix Llobregat and Barcelonès, which belong to the Healthcare Region of Barcelona (RSB) and offer outpatient public healthcare to children and young people from birth up to the age of 17 and a partial hospitalization service for young people between the ages of 12 and 17. 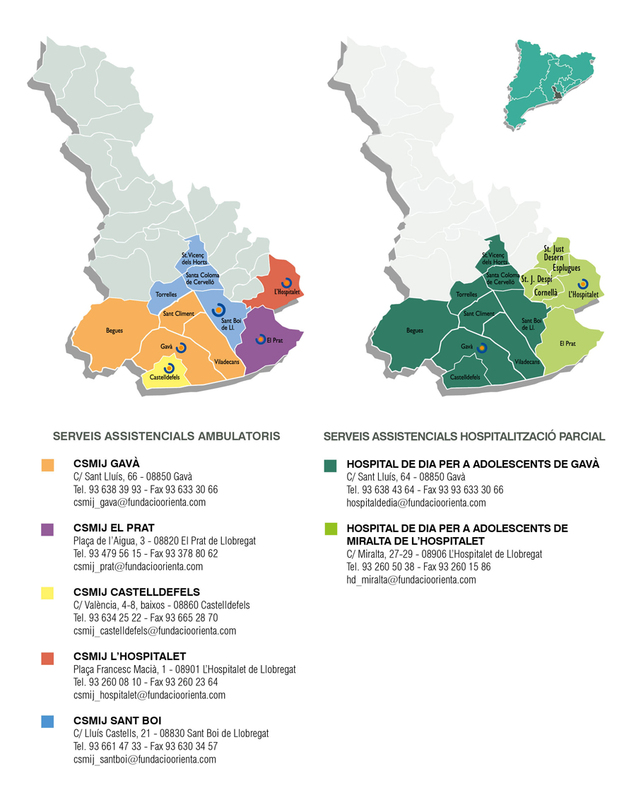 The catchment area for the different services covers the 15 municipalities that form part of the healthcare sectors of Baix Llobregat Litoral and Baix Llobregat Centre/Fontsanta/l’Hospitalet/el Prat, which have a total population aged 0-18 of 150,157 inhabitants (Idescat. BEMC. 2009. Compiled by author). To be a leading institution specialized in comprehensive community mental healthcare for children, young people and their families. To be an international benchmark for mental healthcare for children and young people in the areas of prevention, treatment, research and education. The Orienta Foundation was created on 14 November 1974. 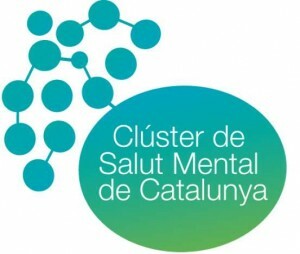 Together with other institutions, it participated the following year in the launch of the Coordination of Mental Health Centres of Catalonia. Its commitment to and defence of free public healthcare for children, young people and their families led to its participation in the creation of the CatSalut Public Healthcare Network of the Catalan Government. From that moment onwards, the Orienta Foundation has steadily grown and now has five mental healthcare centres for children and young people and two day hospitals for adolescents. It is currently the largest institution specialized in Mental Healthcare for Children and Young People in Catalonia. Prevention, health promotion, healthcare, research and education are the Institution’s specialist fields and activities. It has recently incorporated international programmes of great scientific relevance, which have led to improvements in clinical practice, research and education. 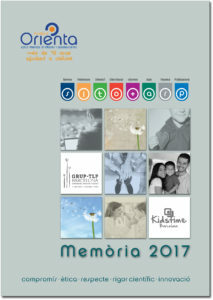 The Board of Trustees of the Orienta Foundation has supported the journal “Psicopatologia y Salud Mental del niño y del adolescente” (Psychopathology and Mental Health in Children and Young People), which is published in print and digital format, and in Spanish so as to reach a greater number of professionals. The legal body responsible for the Orienta Foundation is the Board of Trustees, consisting of renowned professionals in the health and education sectors, as well as in other fields, and a representative of the Comprehensive Healthcare Consortium. Teacher. Councillor of the Personal Services Area. Mayoress of Sant Boi from 1997 to 2007. Doctor. Healthcare Manager of the Comprehensive Healthcare Consortium. Doctor. Vice-dean of the Faculty of Medicine and Health Sciences at UIC (International University of Catalonia). Director of Faceup Projectes. Doctor. Director of Education for the Comprehensive Healthcare Consortium. 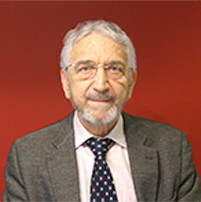 Psychiatrist doctor Medical director of the Benito Menni Mental Health Assistance Complex in Sant Boi de Llobregat, L’Hospitalet de Llobregat and the Vallés Oriental from 2004 to 2017. Clinical Psychologist. Member Emeritus of the Orienta Foundation. Consultant in Clinical Psychology and Bioethics. Doctor of history. Member of the Baix Llobregat Centre of Regional Studies and the Work, Institutions and Gender research group of the University of Barcelona .. Writer. Journalist. Has been a member of the Catalan Parliament and Councillor for Cornellà. Head of Technical and management Secretary of the Orienta Foundation. Psychologist and psychoanalyst, member of the SEP (Spanish Society of Psychoanalysis) and the IPA (International Psychoanalytical Association). Qualified Teacher and Supervisor in Transference-Focused Psychotherapy at the Personality Disorders Institute in New York. Member of the International Society for Transference-Focused Psychotherapy. President of Grup TLP Barcelona. Director of the Journal of Psychopathology and Mental Health of the Orienta Foundation. Works as a psychotherapist for children, young people and families and is specialized in focal psychotherapy for parental roles. Degree in Psychology (UB). Specialist in Clinical Psychology. Resident Psychologist for the Autonomous University of Barcelona at the Puigvert Foundation. Master in Healthcare Quality from the Avedis Donabedian Foundation. Master in the Management of Health Organizations from ESADE. Diploma in the Clinical Management of Mental Health Services from EADA. Deputy General Director at the Orienta Foundation. Registered EuroPsy psychologist and specialist in Psychotherapy for the European Federation of Psychologists’ Associations (EFPA). Degree in Medicine and Surgery from the University of Barcelona. Master in Clinical Management and Organization of Healthcare Services from the Autonomous University of Barcelona. Master in Human Resources Management. Open University of Catalonia. Managing director of CPB Mental Health Services, an entity that includes 12 centres and programmes subsidised by the Healthcare Department since 2002. Director of the Galatea Clinic. Human Resources and Financial Management consultant for various Mental Health companies. · Miriam Berrio. Head of Technical and Management Secretary. · Sílvia Bonfill. Head of Information Systems, clinical records, IT services. · Josefina Martín. Head of Staff and Maintenance Management. · Montserrat Balcells. Psychologist. 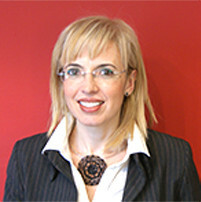 Department Head of the Hospitalet CSMIJ. · Miguel Cárdenas. Psychiatrist. Department Head at the Sant Boi CSMIJ. · Mercè Gibert. Psychiatrist. Department Head at the Gavà Day Hospital. · Victor Ribes. Psychiatrist. Department Head at the Prat CSMIJ. · Brenda Tarragona. Psychologist. 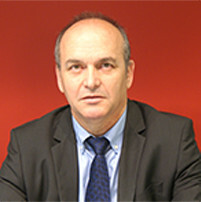 Department Head at the Castelldefels and Gavà CSMIJ. · Tuulikki Trias. Psychiatrist. Department Head at the Miralta Day Hospital. The Orienta Foundation’s strategic plan is the result of a process of reflection carried out by the Board of Directors, the management team and contributions from specialist professionals from the different departments that work in the Institution. Improving the quality and accessibility of our healthcare services. Improving internal communication and external influence. Boosting motivation and professional competence. Optimizing the use of incorporated new technologies. Promotion and continuity of alliances both nationally and internationally. Guaranteeing the efficient management of resources and internal processes in the organization. Increasing research and teaching activities. Guaranteeing financial viability and sustainability. LINE 1: Promote prevention and health promotion. LINE 2: Strengthen external influence and alliances. LINE 3: Promote research, teaching activities and knowledge dissemination. LINE 4: Promote the competence, motivation, participation and recognition of professionals. LINE 5: Improve internal management and promote quality and continual improvement. For all data related with the Foundation’s activities in 2010. For all data related with the Foundation’s activities in 2011. For all data related with the Foundation’s activities in 2012. For all data related with the Foundation’s activities in 2013. For all data related with the Foundation’s activities in 2014. For all data related with the Foundation’s activities in 2015. For all data related with the Foundation’s activities in 2016. For all data related with the Foundation’s activities in 2017. El dia 11 de novembre, a la sala d’actes de l’hospital Sant Rafael, va tenir lloc la IV Jornada organitzada per la Xarxa Catalana d’Hospitals i Centres Promotors de la Salut, sota el lema “Promoció de la salut: visions compartides”. You can access the contact of our centers through the services section.